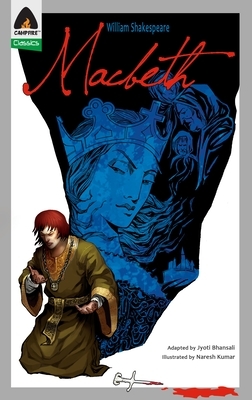 ...'Till the very best among them, Macbeth, gives in to a fatal temptation and commits regicide. But will the crown of Scotland sit easy on his head? Will justice be restored to Scotland? Or will Macbeth remain invincible? One of Shakespeare's most famous plays, Macbeth goes beyond a mere tragedy of moral order to a deeply psychological study of a mind preyed on by ambition, insecurities, fear, and regret. Popularly known as 'The Bard of Avon', William Shakespeare was born in Stratford upon-Avon, most probably on 23rd April 1564. His plays and sonnets have been translated into innumerable languages across the globe, and are undoubtedly the most studied writings in the English language. A rare playwright, he excelled in tragedies, comedies, and histories. Skillfully combining entertainment with unmatched poetry, some of his most famous plays are Othello, Macbeth, A Midsummer Night's Dream, Romeo and Juliet, and The Merchant of Venice, among many others. The characters he created and the stories he told have held the interest of people for the past four hundred years. "I highly recommend Campfire’s comics. They do what they are intended to do and do it in a way that excites kids about classic literature."